Summer is officially over, but we had many fun times while it was here! We offer Summer Art Camps for children ages 7 and up to allow them to develop their drawing and painting skills. Each week the campers created their own original 16”X20” oil painting and partook in a themed field trip to broaden their art horizons. Last month we looked at the first half of our Summer Art Camps and this month we will review the adventures the campers had creating art in and out of the studio in the second half! If your mouth wasn’t drooling after Week 5, it certainly will be after our wee of “How Sweet it Is!” Oh the sweets, the sweets! Our campers got to experience the best sweets San Francisco has to offer! They visited the Ghiradelli Square Chocolate Factory, Norman’s Ice Cream, That’s Sugar, and Aquatic Park (to help burn off all the sugar). Talk about some sweet eats! Time to bring out your inner diva or divo! Week seven brought us “Passion for Fashion!” haute couture was on the brain as our campers became designers for the week. They visited the Fashion Institute of Design and Merchandising in San Francisco and the downtown Anthropologie where they met the visual design team responsible for the fantastic window displays! We may have the next Diane von Furstenberg or Michael Kors in our midst! Whimsy and wonder took us to the Conservatory of Flowers for our “Secret Garden” in week eight. The campers toured the enchanting living museum as they pondered their own glass palaces. The kids then visualized their own dream gardens as they plein air painted in Golden Gate Park. Furry faces were our muses for our week of “Arty Animals!” Taking a trip to the San Francisco SPCA, the kids imagined the future lives the shelter pets would have. On the walk at Fort Funston, the campers got to play and frolic will all the pooches and saw that dogs really do smile! All good things must come to an end, and so it was for the last week of our Summer Art Camp, “Life’s a Beach!” A little sea salt on the palette was welcome when the campers went to Pescadero to plein air paint on the shore. With furrowed brows, the kids mixed their paints to get the perfect shade of aquamarine for the shallow waters and taupes for the sandy beach. The perfect way to end a summer of fun! If you think your little one may enjoy painting outdoors and learning about art and art careers, Art Attack’s Summer Art Camps are a must! Registration for our Summer Art Camps opens up in the Spring and they fill up early. We had a blast this year and hope to see your art camper next summer! 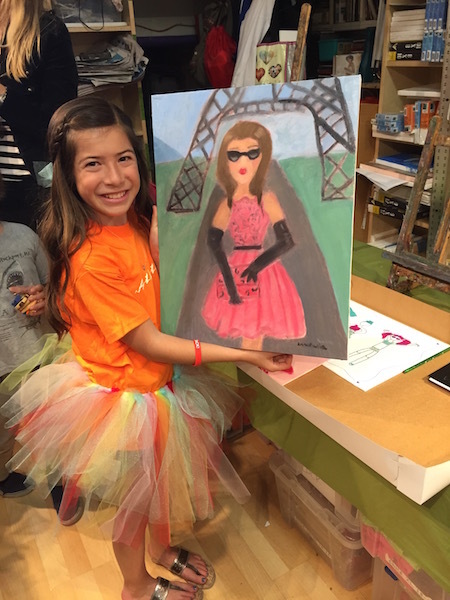 To get a recap of the first five weeks of our Summer Art Camps, click here. Art Attack is an art studio in Burlingame that provides instruction in the fine arts to children, teens and adults. Art Attack offers affordable painting classes year round to the residents of the San Francisco Bay Area. We have art classes for kids ages 5 and up with after school and weekend classes, as well as teen and adult art classes Monday through Saturday. Looking for a place to have a fun and unique party? Art Attack Burlingame also has Arty Parties which are perfect for any occasion: birthdays, showers, girl’s night out and even office team building!